The college has present intake capacity of 210 (181 + ICAR quota) students for B.Sc. (Agri) degree course. Since inception of this college, 6750 students have obtained B.Sc. (Agri.) degree. The Post Graduate programme leading to M.Sc. (Agri.) has been started at this college from academic year 2009-10 and 13 students have secured M.Sc.(Agri.) degree. Three agriculturally progressive districts viz., Kolhapur, Sangli and Satara are under the jurisdiction of the College. 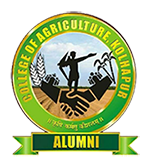 Alongwith the College of Agriculture, Kolhapur there are eleven non-aided affiliated Colleges of Agriculture (6), Horticulture(2), Agricultural Engineering(1), Food Science & Technology (1) and Agri-business Management (1) affiliated to Mahatma Phule Krishi Vidyapeeth, Rahuri are under academic control of this College . The research centers viz., National Agricultural Research Project (NARP); Regional Sugarcane and Jaggery Research Station (RS and JRS), Kolhapur; Central Sugarcane Research Station (CSRS), Padegaon; Agricultural Research Station (ARS), Karad, ARS, Digraj, ARS, Radhanagari, ARS, Gadhinglaj and Regional Wheat Rust Research Station (RWRRS), Mahabaleshwar are the important research stations engaged in need-based agricultural research of the region. 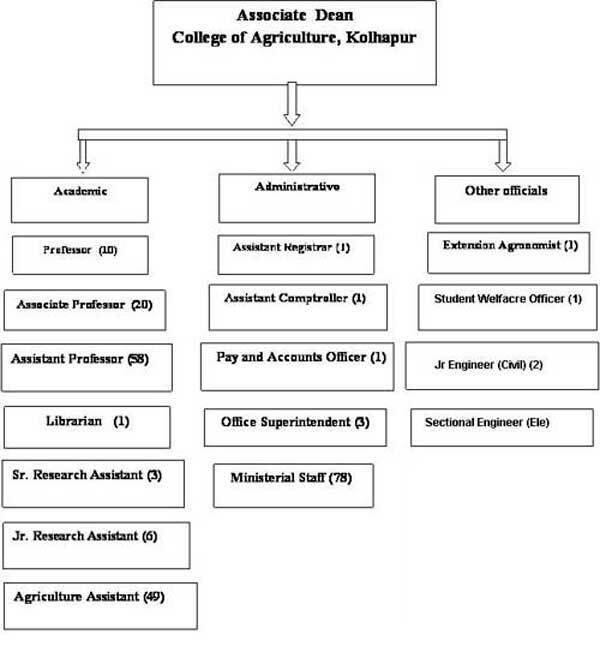 The Agricultural Technical School (ATS), Borgaon, ATS, Kolhapur and ATS, Digraj are in the jurisdiction of this College (Fig.3) for imparting agricultural diploma courses. This college has total land holding of 85.55 ha at college campus; of which, 43.08 ha is under cultivation and remaining 42.47 ha is under roads, infrastructures and hillocks etc. Besides this, 45.83 ha of land is at Shenda Park, Kolhapur which is used as pasture, grazing land and under silvi-pastural system. The first Principal of the College was Prof. A. A. Memon (1963) under his able guidance the initial development and establishment of different buildings, offices and laboratories took place. Prof. Memon in real sense made continuous efforts and provided good initial foundation for imparting education, research and extension activities in the region. Since then the college had reputed, well-experienced and knowledgeable Principals & Associate Deans viz., Dr.T.Y.Patil, Prof.Pc.S.Duduskar, Dr.B.D.Khot, Dr.K.S.Pharande, Prof.R.B.Jadhav, Dr.R.G.Patil, Dr.B.B.More, Dr.B.C. Patil, Prof.S.A.Shende, Dr.P.M.Dhumal, Dr.S.S.Magar, Dr.M.D.Patil, Dr.A.M.Kale, Prof.S.T.Kenjale, Dr.Y.M.Shinde, Dr.R.D.Ghatage, Dr.S.H.Shinde, Dr.A.S.Jadhav, Prof.G.B.Gutal, and Dr.D.M.Sawant who had strengthened the educational and developmental activities of the college. Presently, Dr.G G Khot is the Associate Dean and Principal of this College shouldering the responsibilities since 4th Dec, 2013.